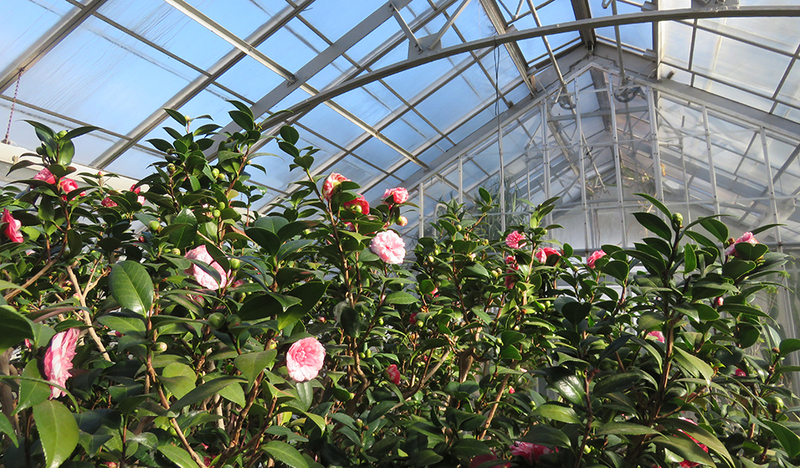 For the past several days, staff and visitors in the Seasonal Display House of the Margaret C. Ferguson Greenhouses have watched the elegant, glossy leaves of the Camellia japonica blossom with vibrant pink flowers. "We look forward to seeing these 'roses of winter' from the time the camellia first comes into bud in November," said Gail Kahn, assistant director of the Wellesley College Botanic Gardens. "Their arrival is a welcome respite from the cold of late January." The Camellia japonica is native to China, southern Korea, and southern Japan, and is related to the Camellia sinensis, which produces green and black tea. Wellesley's camellia offers something far more special—a living link to the College's history. The tree stands 10 feet high and was one of four camellias cultivated and donated by Wellesley founder Henry Durant in the 1870s. Two of the camellias were displayed in Great Hall and perished during the great fire of 1914. The other two were planted in the Seasonal Display House when the Ferguson Greenhouses were built in 1922. Over the years, they began to crowd one another out, and one was cut down to make room for the other. "At some unknown point after that, the remaining camellia started being referred to as the Durant camellia," said Kahn. "Since the founders didn't want any buildings named after them, it's one of the only things to bear the Durant name." In the wild, Camellia japonica blooms from January-March, and can live outdoors in the southern United States, but not in the cold Northeast. "It can be hard to keep a camellia under glass," said Kahn. "Ours has problems with tea scale, a teeny pest insect." Camellias come in many flower colors and in many shapes. "Ours would probably be characterized as a formal double form," said Kahn, meaning that it has many regular rows of petals and no visible stamens. "It's an old cultivar and a unique one. We've never seen another one like it." The striped and spotted blossoms, which range from dark to light pink to almost entirely white, are the result of a benign virus. "Many camellia aficionados consider this variegation to be the ultimate perfection in a camellia flower," said Kahn. "The Durant camellia is the most important plant in our greenhouse collection, and certainly one of the most beautiful." The tree's graceful blossoms will delight onlookers through most of February, and again with a second blooming in April and May. "Henry and Pauline Durant were avid horticulturists, and I have read that camellias were Pauline’s favorite flower," said Kahn. "I’m sure she would be pleased to see this one in its glory."